Ventless gas fireplace with logs, shapes, glass. Alternative gas fireplace designs and rustic gas fires. 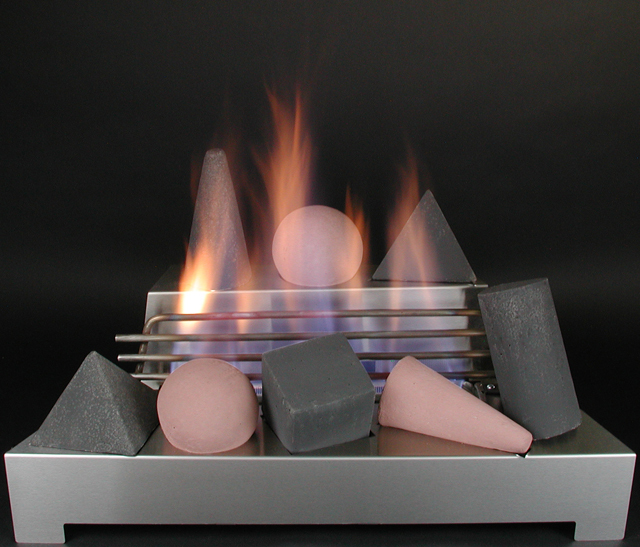 Ventless Gas Fire Shape Fireplaces - New Alternative Fire Shapes. Unvented gas log fireplaces with fire shapes in a variety of colors and sizes for ventless gas fireplaces. The new contemporary trend in fireplaces is now available in ventless gas fireplaces with fire shapes.. Fire shapes are available in a variety of colors and a variety of sizes for unvented gas fireplace burners. 20" Ventless Gas Fireplace Burner, Valve and Fire Shapes. Burner and Remote - Wireless Remote Transmitters sold separately. See remote control options below. Remote raises and lowers burner flames. 16 lbs. 24" Ventless Gas Fireplace Burner, Valve and Fire Shapes. Manual valve: turn knob and push ignitor to light burner and adjust flames. 17 lbs. Remote - Wireless Remote Transmitters sold separately. Wall switch, hand-held, thermostatic, variable and timer. Standing pilot remote to raise and lowers flames. 18 lbs. 30" Ventless Gas Fireplace Burner, Valve and Fire Shapes. Standing pilot remote to turn on/off and raise and lower flames. The remote ready valves listed above can be used with any of the following remote transmitters for your convenience. Rasmussen uses a painstaking molding process to reproduce the finest detail. Rasmussen Objects are Ceramic Bonded Refractory Concrete using high-heat resistant, high alumina-refractory cement with a maximum temperature rating of over 2300 degrees F, lightweight expanded shale aggregates for strength and durability. All ALTERNA Objects are hand colored utilizing environmentally friendly ceramic colors which remain colorfast under fire and which do not create any odor. The ventless gas fireplace fire shape design was the first alternative gas log available. Pyramids, spheres, cylinders and other geometric shapes cause an interesting contrast to the random light of the unvented gas fireplace. 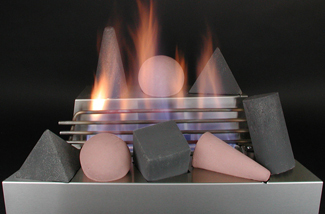 Vent-free gas fire shapes are available in many colors and many sizes and can be mixed to create the color combination best for your decoration.